Beautiful Ocean Views From This Beach Block Home! Steps To The Beach! 3 Bedroom, 3 Bathroom Beach Block Condo, Sleeps 12. Ocean Views From The Deck. 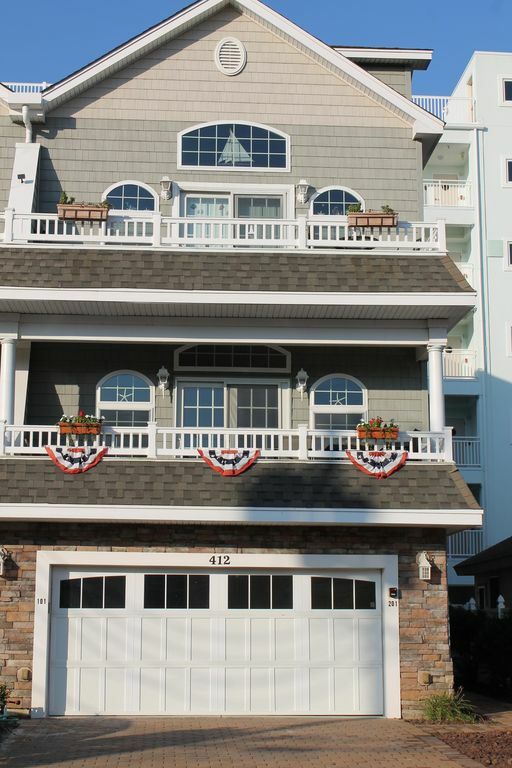 Welcome to "A Pleasure View Too" our beach block condo with ocean views from the deck. There are 4 units in the building. We have the unit directly above the garage, on right side of building. Our deck is the covered deck in the picture. Our 1st floor is located just behind the garage, on the ground level. There are no streets to cross to get to the beach. Sit on the deck and enjoy a cup of coffee, while watching the dolphins swim by in the morning, or enjoy an evening cocktail before dinner. On Friday nights, just walk back to the beach to view the fireworks. If you would like to take the trolley to the boardwalk, the stop is located a half a block up the street. Walk the 3 1/2 blocks down Miami Ave. to enjoy the sunset at Sunset Lake. Bedroom 1/ Second living space during the day- Queen Sleeper Sofa, twin day bed with pull-out twin trundle bed. Wet bar with Mini Refrigerator. There is one parking space in the driveway and one parking space in the shared garage. Garage- has beach chairs, beach umbrellas, 4 bikes (2 adult, 2 children), beach cart, boogie boards, beach toys all to use during your stay. All you need to bring is your linens, towels, and you're set! My husband Vince, my mom Mary and I bought this condo in February of 2016. My parents had a place in Sea Isle City many years ago, that they would rent out. After many years of renting down the shore, it was our dream to once again have a place down the shore. We began our search over Christmas vacation, and fell in love with Wildwood Crest! My family and I decided to buy the condo because of way it looked like and was set up like a house. We had looked at condos in larger buildings, but wanted something smaller. When we looked at this condo, we knew it was the one. We have enjoyed sitting on the deck and watching the beautiful ocean views! In the evening, we will either walk or ride the bikes down to Sunset Lake to watch the sunset. On Friday nights, we only need to take a short walk to the beach to view the weekly fireworks! What is not to love! We believe our condo is in the perfect location. We are a short trolley ride to the boardwalk, steps to the beach. If a visit to the Cape May Zoo or Cape May is what you are looking for, we are a short car ride away. If you have a golfer in the family, golf courses abound out on route 9, which is also a short car ride away. Our family decided this condo was for us because of how close it is to all the places mentioned above. We have members with different likes and dislikes, so our condo and its location has been wonderful for all of us to enjoy our time here as we like. Beautiful beach views right from the covered deck. Beautiful Ocean Views! Beach Block! Includes queen size sleeper sofa, with 60" flat panel TV with cable. Fully Stocked- service for 12, all pots and pans included. Keurig Coffee machine, Mister Coffee machine, center island which seats three. Dining room table seats six with three seated at the kitchen island. Three TV's, flat panel, with HD service. Beach toys, 4 bikes (2 adult, 2 child), assorted other outdoor entertainment items. with side view of beach/ocean. The deck has a table with 4 chairs and 2 lounge chairs. 1 pack and play, 2 booster seats, 2 bed side rails, and 2 baby gates are in the condo. The location could not have been more perfect for my family only being a short walk to the beach. I have 3 small children and being so close made everything so easy. Also the house came equipped with everything you need. The beach chairs, toys/games, bikes and the beach cart. The home was beautifully decorated and really gives you that beach feeling. I would recommend this home to anyone looking for a place to stay. I could see my family and I renting again in the future! Vince and I want to thank you for your review. We are happy to see that you and your family enjoyed your stay and that we were able to things to help make your stay comfortable. We try to include what we think people will need or want, based on what our family likes to have while on vacation. My family has been coming to the Crest for the past few years and this place is truly our favorite! Once we found it, we knew the search was over. The owners, Vince and Lisa, have everything we need to enjoy ourselves: beach chairs, umbrellas, beach cart, boogie boards, beach toys, bikes, games, dvd's, baby gates and a fully stocked kitchen. We only need to pack our linens, personal items and we are set. I especially enjoy sitting on the covered deck and drinking coffee in the morning or having a drink in the evening, just before dinner! Since the place is beach block, it is a short walk to the beach. We love going down to Sunset Lake and watch the sunset or taking a stroll back to the beach Friday nights, to watch the Wildwood fireworks! Do not pass this vacation spot over. We are already p!annouing for year. We are glad you and your family enjoy staying at our place. Having guests who return year after year, lets us know we are doing something right! We look forward to seeing you again next year. Thanks for the review. We all loved the property and location! We had enough space for everyone to be comfortable, 4 adults and 5 children. Very close to the beach (no streets to cross! ), which is not easy to find in WW Crest without being in a large hotel/condo. Owners are very nice and made the whole process very easy! Vince and I are glad you enjoyed your stay with us. We try to provide many items a family on vacation at the shore would need, but might not have the room to pack such as: beach chairs, toys, umbrellas, bikes, games, DVD's to watch, baby gates, bed rails, booster seats, and a full kitchen for cooking large family meals. We pride ourselves in keeping a comfortable, up to date condo that is close to the beach. As such, we would like to have been given suggestions as to how to improve upon your review of our place for future guests, and receive a full 5 stars. Absolutely our favorite place to stay while vacationing in Wildwood Crest! The owners are very conscious when decorating and supplying the place with anything a family needs for a carefree vacation at the beach. It truly is designed to accommodate any size family or group of travelers. Being the first house from beach is not only very convenient when transporting beach gear but also provides a beautiful view to enjoy from the patio. Vince and I thank you for your review. We love having great families stay at our place in the Crest! We are glad you and your family enjoy vacationing with us! Vince and I try to make sure we have everything our family would want or need, while we are vacationing at the shore, available for our guests as well. Townhouse was probably best we have stayed in since vacationing annually in Wildwood Crest. Clean, updated, tastefully decorated and furniture seemed brand new. Was nice having separate entrances for up and down stairs living areas in case downstairs guests were sleeping in. Proximity to beach (1/2 block), having garage to unload from beach each day was also a great feature as was having beach cart, chairs, bicycles all made available (not usually provided in most other places). Would definitely look to stay here again! We want to thank you for your review of our place in the Crest! It is nice to hear that your family enjoyed their stay. We try to think of all the things our family would like to see and have available when we go on vacation. Your input helps us make the stay as enjoyable for future guests too. Our family spends a lot of time researching a 10+ property and we were very happy with Lisa and Vince's home. The house had everything you could think of plus a lot of extras - games, beach chairs, movies, etc. Decor was lovely! Home was clean and updated. And best part - only a two minute walk to the beach! We are definitely going to rent again! Thanks again!! Thanks for your review of our home down the shore! We are glad to hear you enjoyed your vacation! It is nice to hear that your family had a good time and were able to use some of the "little" things we have added to make less packing for families (games, movies, beach chairs etc.). These reviews help us know what works, and what we need to change. Short distance from the boardwalk, water slides, amusement rides, mini golf and other attractions. Pick up the Jitney at the end of the street and ride to the boardwalk in season. View the fireworks from our beach every Friday evening in the summer. Enjoy one of Wildwood's free concerts. Walk a few blocks down the street to the bay and watch the sunset. Drive a short distance to the Cape May County Park and Zoo. Visit nearby Cape May where you can take a tour of Victorian homes or stroll the streets of the walking mall and take in a meal at one of the many restaurants this Victorian town has to offer. Making lasting memories is up to you!